In 2017 the Best Climate Practices contest reaches its fifth edition, after the successful experiences of the “Expanding access to climate financing” competition in 2016, the 2015 contest on “Climate Change and Water Availability for Food Production”, the 2014 edition on “Energy Poverty Alleviation” and the first edition in 2013 on “Urban Resilience”. The focus of the 2017 contest is “Building local resilience to climate disaster risk”. 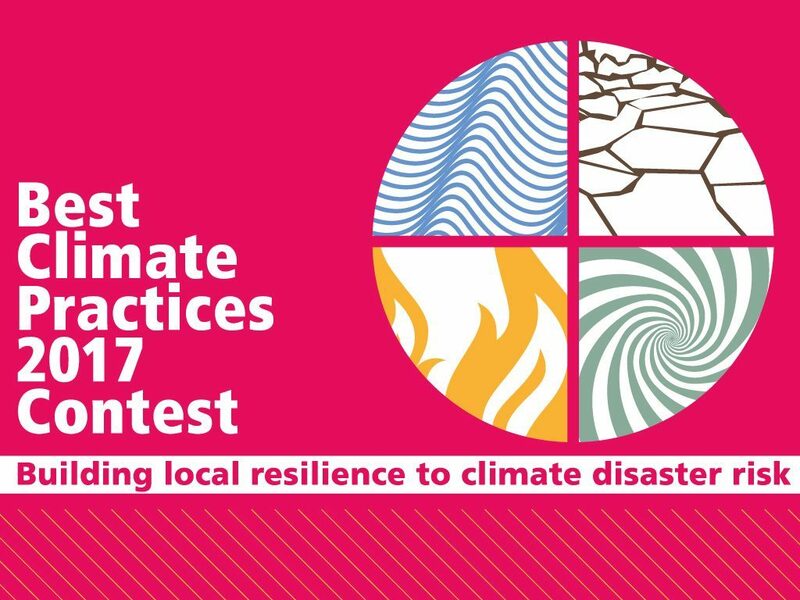 For these reasons the 2017 Best Climate Practices Contest aims to award and promote actionable ideas and concrete projects designed to support urban and/or rural communities in preparing and responding to climate disasters, improving local resilience through enhanced preparedness (ex-ante) and/or recovery (ex-post) capacity. Out of +200 proposals received, 19 shortlisted candidates were selected for the evaluation process carried out through online voting polls on the Best Climate Practices platform and the assessment of the 2017 Expert Panel composed by six high-profile experts from international universities and organisations. Paola Albrito is the Chief of Regional Office for Europe and Central Asia at the United Nations Office for Disaster Risk Reduction (UNISDR). In her current role, she supported the delivery of disaster risk reduction coordinated actions and partnership development within the Hyogo Framework for Action implementation and braced the preparation of the Third UN World Conference on Disaster Risk Reduction and the Sendai Framework for Disaster Risk Reduction 2015-2030. Paola joined UNISDR in 2004 during the preparations for the Second UN World Conference on Disaster Reduction, where she fed the conference with the Outcome Analysis Document on the status of risk reduction implementation at the global level. Her previous field experience includes the coordination of Common Country Assessment and the United Nations Development Assistance Framework in Djibouti in the UN Resident Coordinator Office (1999- 2003); support to the UN Country Teams in developing sustainable development policies at the United Nations Staff System College in Turin; and programme evaluations as consultant at the International Labour Organisation. Elisa Calliari contributed to several international projects on disaster risk reduction and climate change adaptation within FEEM (Fondazione Eni Enrico Mattei), focusing in particular on the Caribbean Small Island Developing States and Latin American countries (Mexico and Paraguay). She is currently an expert on adaptation in transnational regions for the European Topic Centre on Climate Change impacts, vulnerability and Adaptation (ETC/CCA). She has also contributed to the ENHANCE (Enhancing risk management partnerships for catastrophic natural disasters in Europe) project, focusing on the role of Public-Public Partnerships (PuPs) for disaster risk reduction. Her latest achievements include co-authoring the Italian Climate Change Adaptation Plan and the 2017 Science for Disaster Risk Management Report of the European Union. She is particularly interested in climate negotiations and, in particular, in the issue of Loss and Damage from climate change impacts. Federica Ranghieri is Senior Urban and Disaster Risk Management Specialist at the World Bank. She is actually the South Asia Region DRM coordinator, and leads climate resilient projects (CRIP I and II) in Sri Lanka, as well as the Afghanistan DRM program and several analytical works on multi-peril risk assessment, resettlement policies and governance and institutional assessments in India, Sri Lanka and Afghanistan. She coordinated the DRM Program at WBI, where she was TTL for the learning and training program on DRM and managed the Learning from Megadisasters project, which led to the Sendai Conference in 2012. She was also part of the WDR 2015 – Managing Risk for Development team. She joined the World Bank in 2004 with the Carbon Finance Business Unit where she developed the Italian Carbon Fund and from 2007 with EAP on Climate Change – Mitigation and Adaptation policies and Disaster Risk Management. Her last assignment before joining the World Bank was as assistant professor at the University of Milan, where she taught undergraduate Environmental Policies, Environmental economics and post graduate Environmental and Social Communication. Reinhard Mechler has more than 15 years of experience working on socio-economic aspects related to disaster risk and resilience, and climate change. He currently is deputy director of the ‘Risk & Resilience’ research program at the International Institute for Applied Systems Analysis (IIASA). He has been a visiting professor at the University of Graz, as well as a senior lecturer at the University for Economics and Business in Vienna. Reinhard Mechler has been leading and contributing to many international research and consultancy projects. He acted as a lead author on IPCC’s special report on adaptation to extreme events (SREX) and on IPCC’s 5th assessment report (Working group II). Knud Falk is Technical Adviser at the Red Cross Red Crescent Climate Centre. Since March 2010, Knud has worked with the Climate Centre in supporting the Red Cross Red Crescent Movement on climate-related programme development and resource mobilization. He is also involved in Partners for Resilience projects in India, co-developed the Climate Training Kit, and assists in the development of training courses for National Societies. Knud is an expert in the fields of disaster risk reduction, climate change adaptation and ecological monitoring. He has a Ph.D. in Arctic ecology from the University of Copenhagen and experience as a teacher and scientist at several other universities. He has also worked for the Danish National Science Foundation, the Danish Polar Center and the Danish Red Cross. The prize of the 2017 Best Climate Practices Award is 3000 euros (*gross amount subject to withholding tax). Moreover, the Award promotes the winner and other deserving projects in competition through its communication channels and initiatives. The Expert Panel unanimously elected the project “Balangay Legazpi” as the winner of the Best Climate Practices 2017 Award, confirming the ranking obtained by combining jury members’ assessment and the online vote of our website’s visitors. The final results and the winner of the Best Climate Practices 2017 Award were announced on International Day for Disaster Reduction, October 13. The winners of the Best Climate Practices 2017 Award presented their projects during a webinar organized on November 8, 2017, together with experts and scientists discussing the landscape and challenges of climate resilience and disaster risk reduction strategies.